Day 12 LLFH: LOVE workout! Day 12: Heartbreak has taught me how to live with pain. It is a daily workout, helping me to grow stronger, and build my endurance. Some days are harder than others but the key is to never give up. When you run or swim, there is always that moment, when you think you just can’t go any further. Your muscles are throbbing, you’re sweating bullets, and your heartbeat is pounding so hard you can hear it. Do you stop, or do you push a little further? If you stop at the same point every day, you will never reach a bigger goal. There was one time I set a goal for myself to swim 50 laps in one hour. The first day I could barely swim one lap. It had been ages since I did any exercise and my muscles and lungs could barely handle a couple minutes. Everyday I pushed a little further, and everyday I could swim a little more. Before I knew it, I reached my goal, and accomplished something I didn’t think I could. For me, heartbreak, is my emotional workout. It has been over 6 months since I have spoken to my ex, and over 9 months since I last saw him. The pain is still there, but I feel I have grown stronger. I can handle it better now. I know, I CAN live without him, and that is HUGE for me. 6 months ago my biggest fear in the world was to exist without him. His presence was part of me, and I didn’t believe I could do it. How do you live without the person you love? The truth is, you can. 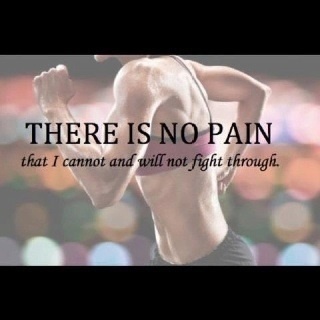 It is not easy but you can function through the pain. Of course, there is a grieving period where you are entitled to mourn and have as much ice cream and self pity as you desire. However, there will come a day where you need to finally deal with it. Fight through and you will be surprised how much you can do. It is a strange mixture of pain, self gratification, and confidence when you accomplish something you didn’t believe you could. I get the same feeling after I run. I am sweaty, and gross, and my blood is rushing, but I feel good. The most amazing discovery for me was being able to feel joy, even though my heart was in pain. I always believed if you were in pain you couldn’t be happy, but both is possible. You might not have one thing, but there are so many other things you do have. There are all kinds of love out there. There is love with family, and love with your passions, love of nature, etc. I get so much joy from painting and playing music. When I do these things, I don’t think about my ex, and it helps me get to know myself again. There is so much more to me, than just my existence with him.